Recently at a family gathering, I reflected on the different ways people related to each other. For some of us, I noticed we would make small talk for a minute, then move quickly to sharing info on our phones, showing a picture, sharing a link or trying to learn how to download. In fact, two family members even recorded music on their phone and I heard it being listened to on multiple devices around the house that day. At another point, I sat down at the kitchen table and talked for a long time with a member of the family who wasn’t attached to any device. In fact, her up-to-date tech devices consist of a cassette tape player and a clock, that instead of chiming, whistles birds sounds each hour. During this conversation, it was all eye contact and connection and the conversation went on for a long time. I once heard a phrase that some people are high tech and low touch. They spend lots of digital time but don’t have a personal connection. Maybe we should practice being low tech / high touch now and then. It just doesn’t seem like you can do both, at the same time, very well. I was recently intrigued by Michael Hyatt’s new push to sell paper calendars / to do planners. After several years of hearing him talk about the world of digital calendars and apps, it’s come around to a much more low tech, yet seemingly effective method – pencil and paper! For many of the 20 something’s I’m around, the phone/device conundrum has solved itself. It’s like they grew up with the thing and the buzz is gone. They keep it tucked away for the most part and they spend time talking with others in public settings. It’s just not that big of a deal anymore. Low tech, high touch. Now, it’s the 40 years-olds who are attached to their phones and can’t seem to break away. Magnolia Table, the Waco, TX restaurant/complex operated by Chip and Jo Jo have even gone low tech. They mounted small pouches near each table and booth so people could deposit their phones in them while they have dinner and (drum roll please) talk face to face during a meal. Their goal was connection and community – low tech. It’s become more and more popular to be low tech and high touch. Keep your phone in your car during dinner tonight. Call someone and talk instead of texting. Take time to smile, use the first name and make small talk with servers, bank tellers or others you may run into today. if you’re leading a ministry group, pull out physical copies of the Bible for the devotion time. 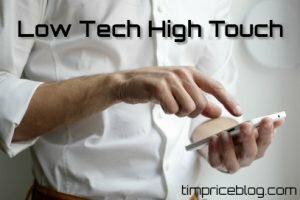 What other ways can you be low tech, high touch today?